I think I’ve known for a while that I would have a blended family. One big melted pot of goodness. I didn’t know what it would look like or how it would feel but I did know that as long as love was the key ingredient I would be down. My view of the world is different than others. I don’t believe everything is so black and white. You can’t make everything a cookie cutter situation but what you can do is take what you have a make magic. My relationship with my children’s father was just not meant to be. I know, understand and have accepted that for quite some time now. I believe it takes a strong person to admit or even comprehend that maybe JUST maybe the only purpose that person served in your life was to help you create those beautiful babies and THAT’S IT! It’s hard to wrap your mind around…I know. You wonder how they could not want to be apart. Why don’t they try…etc? Guess what?! That’s NOT your job! You are responsible for YOU! We can’t force people to do things they are unwilling and have you seen the news lately? I won’t force a dog to something they don’t want to. Sometimes, it’s just better that way. Since, my acceptance of this fact there are a few things I’ve had to come to terms with. 1. I may not parent like my partner. 2. Set boundaries – children, other parents. 3. Communicate your goals effectively. 5. Let your children have an opinion in the relationship. Number 1 - has probably been the hardest for me. I tend to date people who are the COMPLETE opposite of myself. I’m very reserved…I enjoy a good time but I don’t let my hair down as often as I should. In turn, I have found myself with very outgoing people that challenge me. They allow their children to be wild and free and I grew up with the mentality that children should only be seen and not heard. I still believe that is true is some sense. Number 3 – Family goals! I am big on having goals and making sure that a family is functioning properly we must have some goals in place. They can be simple as getting in the habit of having family meetings and this can be tough especially when you have kids in different households most of the time. Maybe you have that on lock already, so a savings goal maybe better, whatever your needs stick to them. Number 4 – Prepare your children! This probably seems like a no brainer but remember you aren’t the only ones who are blending. Your children need to feel safe with their new bonus family. It’s going to take time. A therapist once told me that before blending completely the family should spend time together throughout the week, if possible. If one family is moving into one house then the other parent and children should spend the night a few nights a week to help the children adjust. Number 5 – Allow your children to have an opinion about your relationship. I’m not saying let your children CONTROL the relationship but they should get a say so in it. Imagine how difficult it would be to have to be at war with your spouse and child all the time. It’s not a fun place to be. Sometimes, your children can pick up on things that you can’t and you need to listen to that! Most importantly, love like you never have before. Your heart has to be BIG to love and care for someone else’s children. Blended families are not for everyone! 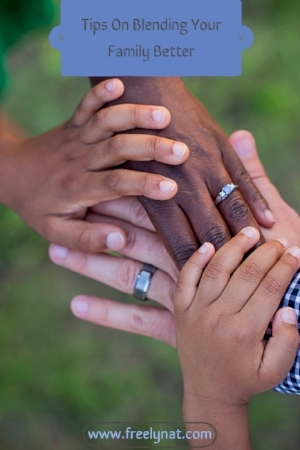 Do you have some insight on blended families or want to share your story? Hit me up!